Guesthouse Indigo Distance to the centre of town 3.5 km price per day from €40 Guesthouse Indigo is located in a newly built residential area of Zagreb, 4 km from the centre and 3 km from the Main Train station. 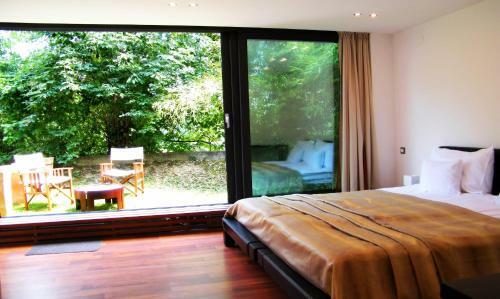 The elegant, individually furnished rooms are air-conditioned and soundproof. They feature a flat-screen TV, a refrigerator, a tea/coffee maker, a toaster, and a bathroom. Bundek Park is 300 metres away, while the Zagreb Fair can be reached in 1. A couple of stores, a restaurant and a cafe are located on site. Hotel Antunovic Zagreb Distance to the centre of town 6.7 km price per day from €79 Hotel Antunovic is situated on Zagreb's main street and offers free entrance to the spa facilities and superb cuisine. All air-conditioned rooms feature safes, minibars and bathrobes with slippers. Guests can sample traditional Croatian dishes at the à la carte Argante Restaurant, the self-service Lucia Restaurant and have something sweet from the patisserie. Lobby Café Bulle serves morning coffee and croissants, accompanied by a wide selection of newspapers from all over the world. Garden Hotel Distance to the centre of town 1.6 km price per day from €43 Located in Vodnikova Street in Zagreb’s centre, Garden Hotel was renovated in 2013. It offers an à-la-carte restaurant and coffee bar with a terrace, free Wi-Fi and modernly furnished rooms. Breakfast is served each day at the hotel’s restaurant, while other facilities include laundry and dry cleaning service. A Wellness and Spa Centre can be found at the nearby hotels. The Main Square and the Old Town can be reached in 1. Rose and Margaret Apartments and Rooms Distance to the centre of town 0.7 km price per day from €37 Located on one of the main shopping streets, in the centre of Zagreb, Rose and Margaret Apartments and Rooms offers modernly furnished accommodation with free Wi-Fi access. All accommodation units are air-conditioned and provide a flat-screen satellite TV. Some units come with either a kitchen or a kitchenette. Dolac open-air market is located 300 metres from Apartments and Rooms Rose and Margaret. Hotel Aristos Distance to the centre of town 7.5 km price per day from €80 A 10-minute drive from Zagreb Airport, Hotel Aristos offers free garage parking and free use of a gym and business centre. 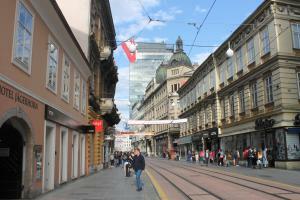 Zagreb's centre can be reached within a 15-minute drive. The soundproofed rooms at Aristos Hotel are spacious and they have been decorated with pastel colours. They have large beds, elegant bathrooms and flat-screen satellite TV. All guests enjoy free access to the fitness room and business centre, while only the deluxe rooms include free entry to the hotel’s 400 m² spa area, which features 3 saunas, hot tub and steam room. DoubleTree by Hilton Zagreb Distance to the centre of town 2.2 km price per day from €100 Situated in the heart of Zagreb’s business district, only 2 km from the city centre, DoubleTree by Hilton Zagreb features elegantly decorated rooms and suites, an indoor pool, a Turkish bath and a Finnish sauna offering panoramic views. The bathroom features a walk-in rain shower with Crabtree&Evelyn toiletries. Oxbo Grill Restaurant&Bar offers adventurous cuisine based on grilled meat and fish dishes. 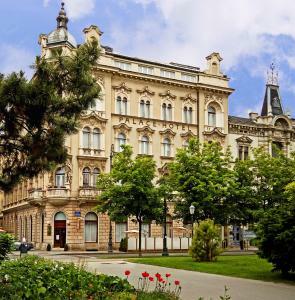 Palace Hotel Zagreb Distance to the centre of town 0.8 km price per day from €90 Enjoying a superb location in the centre of Zagreb, the traditional Art Nouveau Palace Hotel Zagreb offers warm, familiar atmosphere, excellent services and highly skilled, attentive staff. Overlooking one of Zagreb's most beautiful parks, the hotel is only a 5-minute walk from the main city square and the historical core of the city. Sample international and local cuisine at the restaurant, with an accent on local specialities, created by the hotel’s award-winning chef de cuisine.